While online retailers have opened us up to a global marketplace, there’s a growing movement to “go local” by patronizing and supporting community businesses. Many real estate buyers and sellers want to work with someone from their neighborhood who understands the culture, preferences, and quirks that make their community unique. In the old days, locals would “pop in” or call our office after viewing a listing flyer in our window, or simply because they’d driven by our office for years. This “foot traffic” made up a large portion of our buyer and seller leads. With advancements in technology, we no longer have to wait for these passerbys to walk through the door. We can find out who they are without ever meeting them … and let them know we’re here, we’re open for business and we’re ready to serve them. The first step to connecting with locals on Facebook is to ensure your location and contact information is correct. On the “About” section of your Business Page, check to make sure each category is complete. Without these details, Facebook doesn’t know where you are, when you’re open, or how to connect you with potential customers. Once you’ve completed this information, make it easy for visitors to your page to contact you. You can change the call-to-action button on your Facebook Business Page to “Call Now,” which enables customers to call you directly through Facebook. Others may prefer to message you through Facebook. In fact, 56% of people would rather message a business than place a phone call. You can and should use Facebook’s Response Assistant to ensure a positive experience for anyone who contacts you through Facebook Messenger. Response Time: Give an accurate time frame. It’s better to set a realistic expectation and meet it than to overpromise and underdeliver. Away Message: Send an automatic message if you expect to be unresponsive for an extended period of time and let people know when they can expect to hear from you. Instant Reply: Send an automatic response to confirm receipt of the message and thank the sender. Messenger Greeting: Send a customized response the first time someone contacts you via messenger. To further personalize these responses, click on the “Add Personalization” link and use autofill to address the sender by name in your reply. Here, you can learn a lot about your local foot traffic. For example, you can find demographic information about people in your area, as well as the busiest time and day of the week. Toggle between options along the top to further explore Date Range (one week, one month or one quarter) and Region (within 165 feet of your office or the entire zip code). This information can help you determine peak times you should have a physical presence in the office, when to schedule an event, or perhaps when to put out an “Agent on Duty” sign. And by understanding your local demographic, you’ll have a better sense of the type and style of ads that will be most effective. Now that you’ve discovered who is in your local area, you can reinforce your presence and strengthen your brand awareness by running targeted Facebook ads to those individuals. Awareness ads are an important component of your marketing strategy. They remind people who have passed by your office or seen your signs around the neighborhood that you are a fixture in the community. Start with a modest budget of a dollar per day and test a few versions to see which ones are most effective. A local awareness advertisement’s main goal is to grow brand recognition amongst people in your area who are likely to move. Ideally, someone sees your ad and fills out a contact form the first time they visit your website. But that’s not always going to happen. The reality is, they might not be ready to contact you yet. That’s often because they aren’t ready to move now … but will be one, two or six months down the road. Facebook Pixel can be incredibly useful in these scenarios. It enables you to create a list of people who have visited your website previously so that they can be “retargeted” with ads in the future. Basically, it’s a way to follow up with people who have shown some interest in you (by visiting your website) but weren’t yet ready to talk. And chances are, if they are clicking on your Facebook ads, and visiting your website, they probably have some interest in buying or selling real estate in the future. Paperless Agent Coaching Club Members have access to training on Advanced Facebook Ad Tactics, which includes step-by-step video instructions on how to set up Facebook Pixel and create custom Facebook ad campaigns so you can get started immediately. Not a Coaching Club Member? 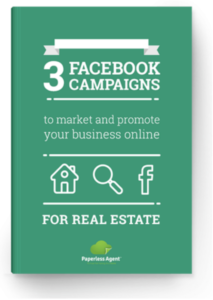 You can still learn more about how to advertise and grow your real estate business on Facebook with our FREE report: 3 Facebook Campaigns for Growing Your Real Estate Business. Love the training. It's providing t to e answers to most of my qustions regarding the basics of online marketing as well as step by step instructions on the "how to's. " Thank you Chris and Garry!